Retinol 0.3 is a concentrated facial cream with pure retinol that improves the appearance of visible signs of aging and pores while minimizing breakouts. Recommended for first-time retinol users. This retinol cream for face helps improve the appearance of fine lines, wrinkles, discoloration, blemishes, and pores by accelerating cellular turnover. 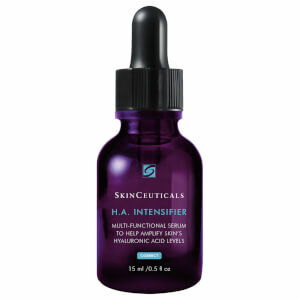 Retinol 0.3 is ideal for continued use or for conditioning skin as a prerequisite to SkinCeuticals Retinol 0.5. This potent night-time treatment features 0.3% pure retinol enhanced with the latest stabilization and delivery technologies to ensure a steady, even release. SkinCeuticals Retinol 0.3 is formulated with soothing bisabolol to minimize irritation and specially packaged to preserve its potency. Retinol 0.3 employs an optimized delivery system and protective packaging to ensure stability and efficacy of pure retinol. Topical retinols have been used by dermatologists to help combat and reverse the visual effects of aging, such as wrinkles, laxity, and discoloration. Retinols because they accelerate cell turnover, can also improve blemishes and the appearance of pores. Aqua/Water/Eau, Propanediol, Dimethicone, Cetearyl Ethylhexanoate, Alcohol Denat., Dipropylene Glycol, Ammonium Polyacryloyldimethyl Taurate, Hydrogenated Lecithin, Allyl Methacrylates Crosspolymer, Phenoxyethanol, Caprylyl Glycol, Isopropyl Myristate, Retinol, Polysorbate 20, Sodium Citrate, Boswellia Serrata Resin Extract, Dimethiconol, Trisodium Ethylenediamine Disuccinate, Bisabolol, Citric Acid, Bht, Propyl Gallate. I had used Retinol products recommended for my aging skin and I was always so irritated and red after a few uses and would stop! Nothing looks worse than red dry rough looking skin. That being said I attended an event at which I met an esthetician who told me to try this product and use once at night every other day or every third first it’s goal to build up to level of this strength to be able to use nightly It’s worked superbly for my sensitive rosacea prone 60 yr old face. I am now going to use this strength until gone nightly before moving up to .5. I am a super happy face!! !